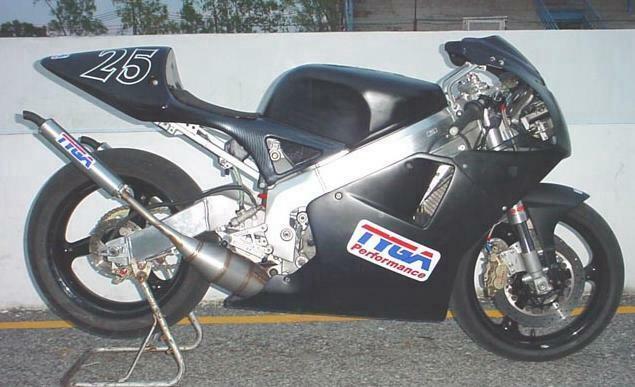 The 1992 RS250 NF5 motor share very similar dimensions to the NSR250, so in theory the RS motor should just 'bolt in'. 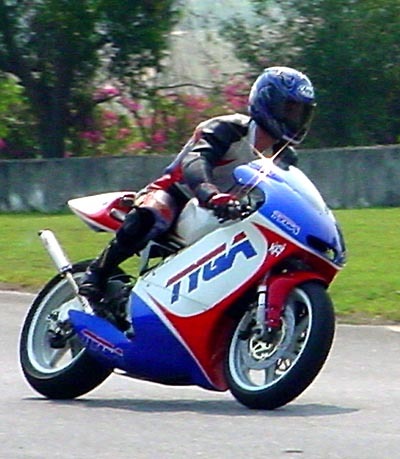 However, the RS motor is rigidly mounted in the RS frame for added strength, whereas the NSR is rubber mounted for street orientated, user friendliness. This first obstacle was easily overcome with some aluminium spacers, and the deft use of the hacksaw and file to remove an offending engine mount on the RS motor. The engine is now solidly mounted at the rear two positions, with the front mount being rubber mounted, as we were a little worried that rigid mounting of the front stay may overstress and crack the spindly NSR engine mounting spars. Reinforcing this spar is an option, and would allow for rigid mounting. 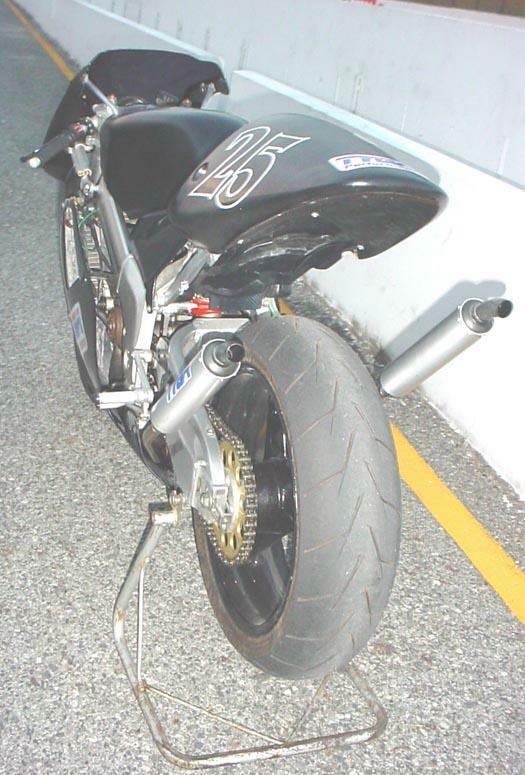 The support lug for the lower coil/fairing stay bracket also had to be ground off for engine clearance. The stock RS250 PJ38 carbs fitted with no interference from the NSR chassis and are tugged open with a one off cable fitted to the stock NSR throttle body. 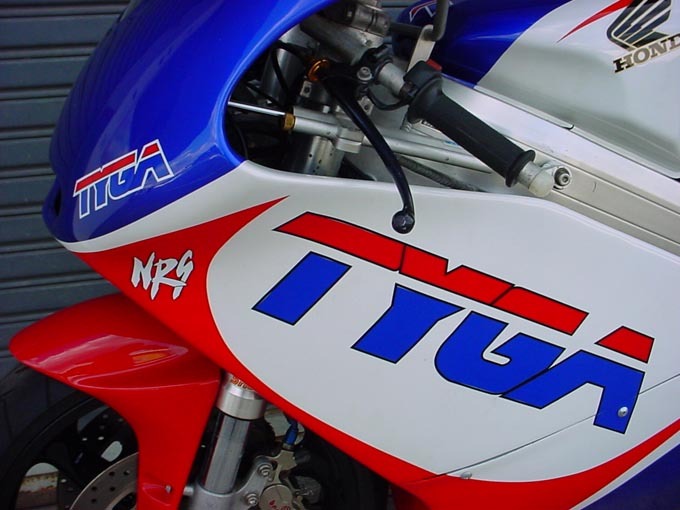 The stock RS pipes don't fit the NSR chassis, but not a problem as they're our forte, so TYGA SS pipes were fitted. The cooling is taken care of by a stock RS250 radiator, custom mounted to the NSR frame. The next plan was the chassis. The front end has been changed several times. We started off first with adjustable MC21 SP forks and an MC21 Magtek. 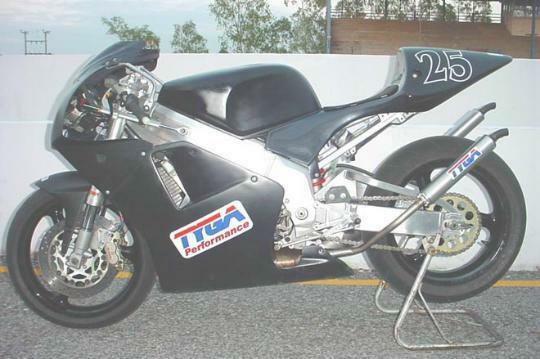 These were soon changed for the enhanced cosmetics of RVF400 USD forks and front wheel. 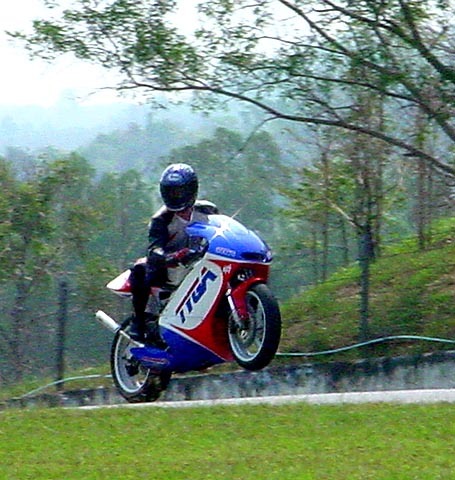 We liked the idea of USD suspension, so we changed again for Yamaha TZR250SP USD forks. These almost made it to the end, but at the last minute I went all soft and offered my RS forks, as it would've been a shame to see the bike wearing anything other than Showa's finest. 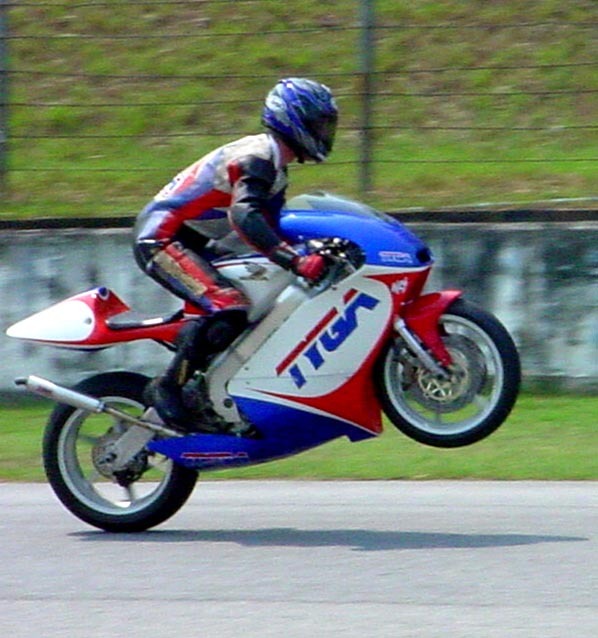 The wheels had also been changed as many times as the forks, and always using Honda wheels, but as I had already done all the ground work and had fitted Yamaha TZ250 Marvic magnesium wheels to my 300, it seemed rude not to use them. The 3.5" x 17" at the front is wearing fully floating Yamaha XJR400 disks, grabbed by the finest billet, Brembo calipers. The Master cylinder is RS250, feeding TYGA brake lines. At the blunt end is a 5.25" x 17" wheel, with a modified TZR250 disk and sprocket holder with a TZ250 sprocket. The rear is slowed by a super small, two piston billet Brembo caliper. The electrics was an easy choice as our first intention is a track only bike, so the complete RS250 wire harness and PGMII was fitted. All components are RS250 apart from the coils. We used NSR coils to supply the sparks, with small mods to the harness for fitment. The meter stay is an RS250 stay, modified to fit onto the original NSR chassis mounts, and uses the stock RS250 tacho and digital temp gauge. It allows for the RC valve servo to be relocated in the racing position up front for easy access. 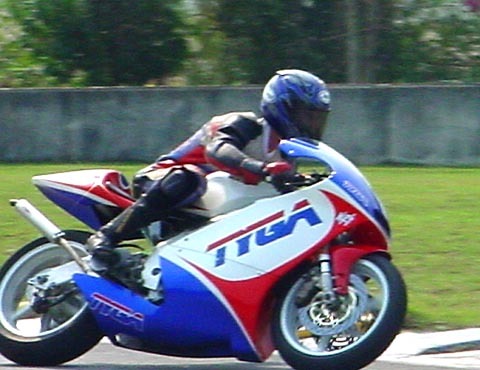 The top of the fairing is held on by a TYGA Lyte meter stay. The tank is a stock MC21 item with a TYGA carbon look filler surround. The cowling is a TYGA Performance "Ram Air" model. Later we may actually fit ram air or possibly put lights in the duct hole. The screen is also a TYGA item and is a double bubble version in dark tint. 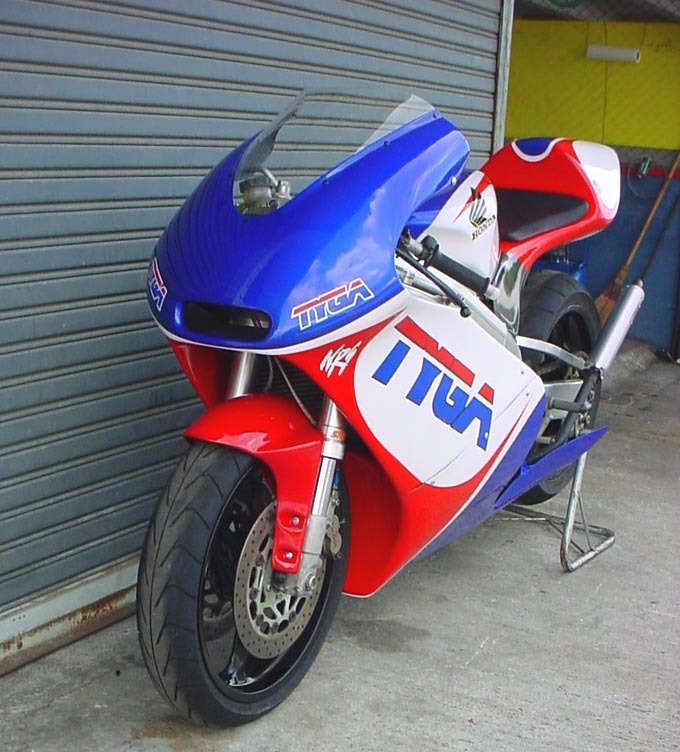 The front fender is a TYGA copy of the RS250 item to match the forks. 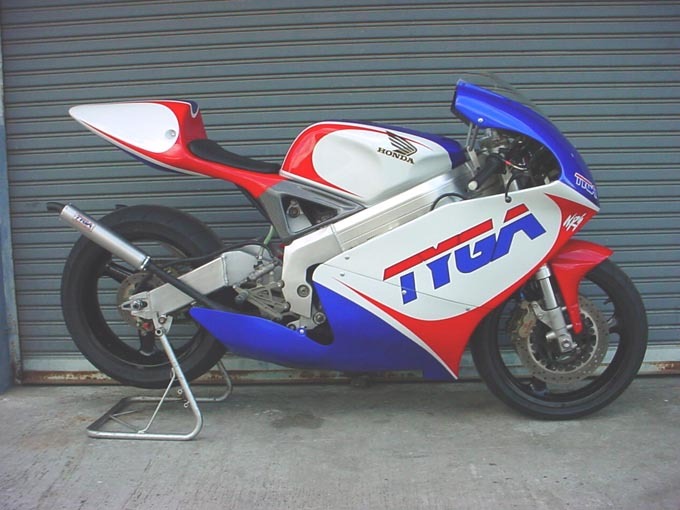 The NRS uses the prototype TYGA GP250 seat cowl which has been partly finished in carbon look. 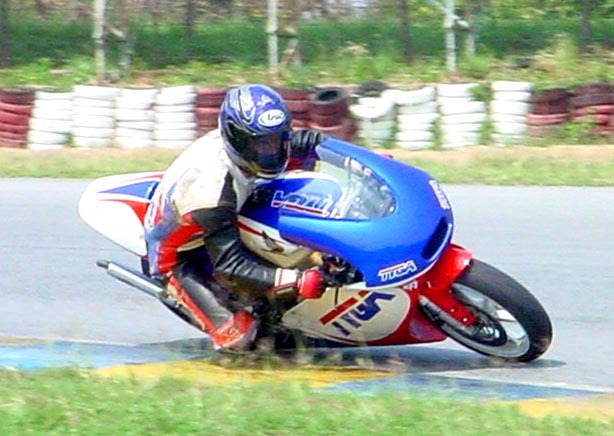 Engine - 1992 RS250. 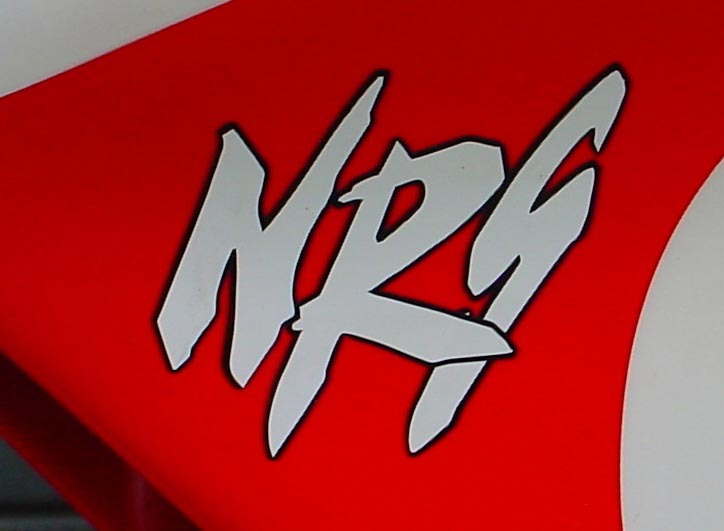 Modified to fit NSR chassis. 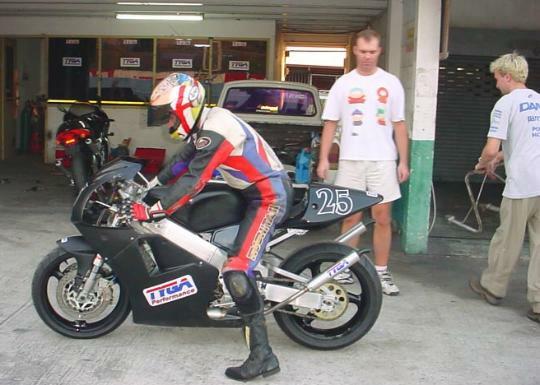 Electrics - 1992 RS250 including RS250 tacho and digital temp gauge. 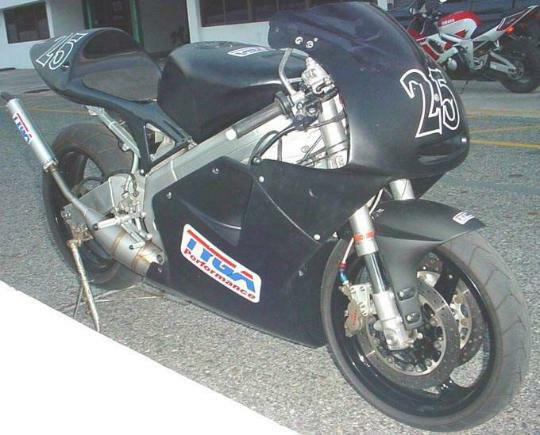 Chassis - MC21 chassis and swingarm modified to fit RS250 engine. With all new TYGA racing step kit. Front suspension - 1992 RS250 USD forks and triple clamps with al steering stem. 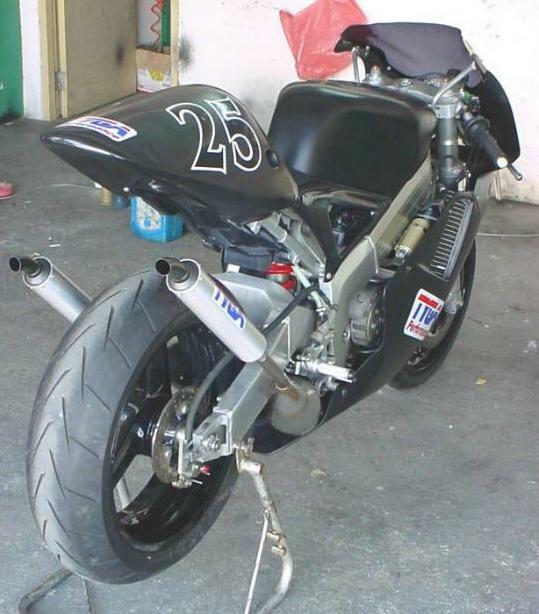 TZ250 bars and Ohlins damper. 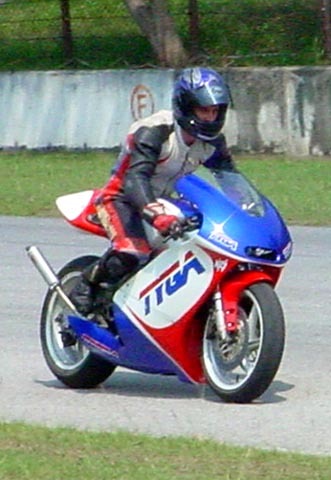 Wheels - Yamaha TZ250 Marvice magnesium. Fr. 3.5"x17". Rr. 5.25"x17"
Disks - Fr. Yamaha XJR400 full floating. Rr. 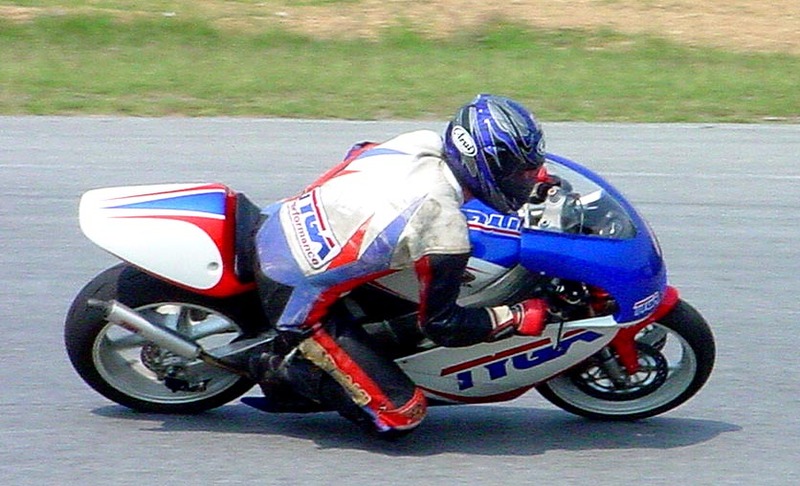 Yamaha TZR250SP modified. Brakes - Fr. Billet Brembo, TYGA lines, RS250 master cylinder. Rr. Billet Brembo, stock brakeline and master cylinder. 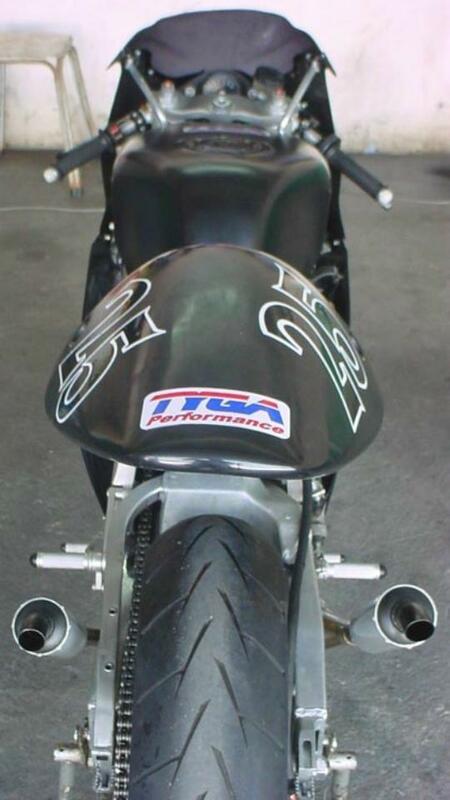 Bodywork - TYGA products, consisting of TYGA Ram Air upper, TYGA lowers, TYGA GP250 seat cowl and TYGA RS250 front fender. All custom parts designed and made by TYGA Performance. Obviously the engine is a big improvement over the stock MC21. With over 70hp on tap it not only sounds fantastic, it runs like a scolded cat. For a motor with a GP pedigree, it actually makes very acceptable midrange. 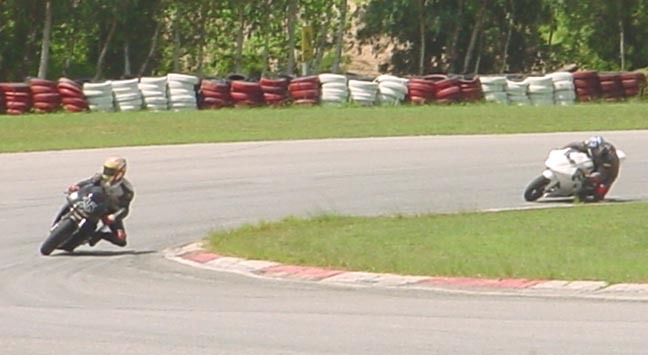 It's currently geared for around 135mph at 12,500 rpm, and hits this without fuss at the local circuit. The RS front end copes very well (as it should), and the brakes are awesome, with never any more than a couple of fingers needed to slow things down. The rear end coped as well as expected. Maybe a change to a harder spring will be in order once the bike is dialled in. 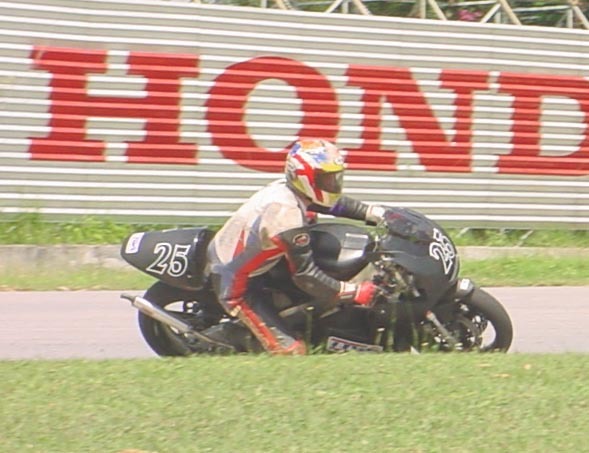 And finally, the Dunlop's weren't even threatening to break away, but I was being a bit cautious with the throttle.